Traveling 301 million miles (548 million km) from Earth, the Mars InSight spacecraft was due to reach its destination on the dusty, rock-strewn surface of the Red Planet at about 3 p.m. EST (2000 GMT). The mission control team at NASA's Jet Propulsion Laboratory (JPL) near Los Angeles prepared to conduct a final adjustment to the InSight's flight path on Sunday to maneuver the spacecraft closer toward its entry point over Mars. If all goes according to plan, InSight will streak into the pink Martian sky nearly 24 hours later at 12,000 miles per hour (19,310 kilometers per hour). Its 77-mile descent to the surface will be slowed by atmospheric friction, a giant parachute and retro rockets. When it lands 6-1/2 minutes later, it will be traveling a mere 5 mph (8 kph). The stationary probe, launched from California in May, will then pause for 16 minutes for the dust to settle, literally, around the landing site before its disc-shaped solar arrays unfurl to provide power. Engineers at JPL hope to get real-time electronic confirmation of the spacecraft's safe arrival from miniature satellites that were launched along with InSight and will fly past Mars. The JPL controllers also expect to receive a photo of the probe's surroundings on the flat, smooth Martian plain close to the planet's equator called the Elysium Planitia. The site is roughly 373 miles (600 km) from the 2012 landing spot of the car-sized Mars rover Curiosity, the last spacecraft sent to the Red Planet by NASA. InSight is the first dedicated to unlocking secrets from deep below the Martian surface. The lander will spend 24 months - about one Martian year - using seismic monitoring and underground drilling to gather clues on how Mars formed and, by extension, the origins of Earth and other rocky planets of the inner solar system more than 4 billion years ago. "What this helps us understand is how we got to here," said JPL's Bruce Banerdt, InSight principal investigator, during a pre-landing briefing with reporters last week. While Earth's tectonics and other forces have erased most evidence of its early history, much of Mars - about one-third the size of Earth - is believed to have remained largely static over the eons, creating a geologic time machine for scientists. InSight's primary instrument is a highly sensitive French-built seismometer, designed to detect the slightest vibrations from "marsquakes" and meteor impacts. Scientists expect to see a dozen to 100 marsquakes over the course of the mission, producing data to help them deduce the size, density and composition of the planet. The Viking probes of the mid-1970s were equipped with seismometers, but they were bolted atop the landers, a design that proved largely ineffective. 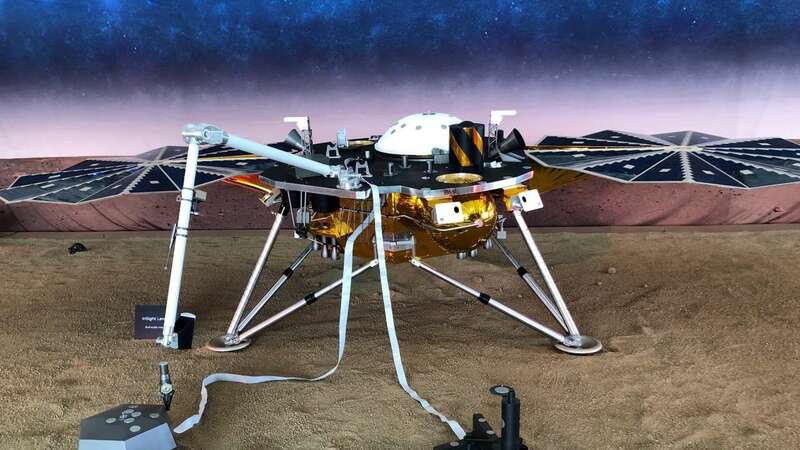 InSight also is fitted with a German-made drill to burrow as much as 16 feet (5 meters) underground, pulling behind it a rope-like thermal probe to measure heat. The InSight and next rover mission, along with others in the planning stage, are seen as precursors for eventual human exploration of Mars, NASA officials said.